We take pride in using only the most trusted resources for building your home. All of our suppliers are local, giving you the kind of service and professionalism that you expect and deserve. When you build with Loyalty Homes, you can rest assure your home will be well-built with the utmost attention to every detail. Whirlpool appliances are innovative, sleek and top-of-the-line. From refrigerators to ovens, your home will be efficient with the newest models from Whirlpool. And you’ll have additional peace-of-mind knowing that your appliances came from Karl’s Appliance in Sioux Falls, a service-first company who’s been in business since 1956. Visit Karl’s website to see Whirlpool. We use only Delta’s brand-name, state-of-the art plumbing fixtures for your kitchen faucets, bathroom sinks, toilets and showers. Your home will shine with the variety of finishes available from Delta. Visit Delta’s website. The kitchen is the heart of any home. Make it stand out with custom cabinets from Showplace – the best local source for gorgeous kitchen cabinets. Featuring traditional wood finishes from maple and oak, to modern , rich woods like cherry, knotty alder and painted woods. Your kitchen will be the jewel of your home. Visit Showplace’s website. Montgomery’s has been serving the greater Sioux Falls area since 1888, and provides the most reputable design and installation of anyone in the area. You’ll have the choice of your own personal preference for siding, ranging from tile, carpet, laminate, vinyl and more. Montgomery’s installs and carries them all! Visit Montgomery’s website. With over 40 brands of unique lighting options to choose from, you’ll love the finishing touches that lighting from Sioux Falls LightHouse will add to your home. As a local provider, they go out of their way to ensure your satisfaction and excitement for the lighting in your new home. View Sioux Falls LightHouse’s website. When it comes to high quality millwork, doors, windows and other finishes for your home, Builder’s Millwork is the most reputable supplier in Sioux Falls. Your home will have gorgeous woodwork that you’ll enjoy for decades. Visit the Builder’s Millwork & Window website. Keep the elements out with reliable, high-efficiency windows and doors from Vector. With countless options to light up your home, you’ll see the beauty of the outdoors without any drafts. Vector windows are ENERGY STAR rated, offering the latest advancements to reduce energy consumption. Visit Vector Windows’ website. Featuring Genie Brand garage doors, Overhead Door Co. is our trusted supplier for your home’s garage door needs. Since convenience and safety are key to ensuring your garage is fully utilized, we’ve chosen Genie Brand garage doors to make your garage the most usable space it can be. Visit Overhead Door’s website. Boost your home’s curb appeal and enjoy complete peace of mind with roofing from Cambridge. Their heavy shingle weight is designed to have a greater resistance against weather and to stand the test of time. It’s algae resistant and can withstand wind up to 110MPH. View Cambridge’s website. Your home’s building materials will come from PROBuild Lumber right here in Sioux Falls. With quality as their first priority, you’ll have confidence knowing you’re building with the highest-level of products available. Visit the ProBuild website. Goodman’s 96% furnace and 13 year air conditioning units are built to last and will keep your home at optimum temps year round. 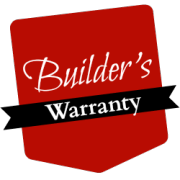 They also offer one of the best warranties in the industry and are top-quality at an affordable price. Visit Goodman’s website. We stand behind every home we build, with a warranty that will give you confidence and peace of mind.